Box Tops for Education. Yes, those cereal box tops DO make a difference. Last year we raised over $500 with this program. A Box Top collection envelope is located in every classroom and a box is located in the office. Please see below for more info. Book Fair. This is an annual favorite and all proceeds go towards purchasing new SmartBoards and more books for the AR program. Don't forget to turn in those Box Tops you’ve been collecting. Raising funds through Box Tops is simple and takes very little effort. There are only three easy steps to clip to support our school and not cost you a penny more. It’s like earning FREE money! Clip Box Tops - Find Box Tops coupons on hundreds of your favorite products that you and your family are purchasing already. Each Box Top coupon is worth 10¢ for our school. Send Box Tops to school - Turn in your Box Tops coupons to class or front office. PTA will send the Box Tops coupons to Box Tops for Education. 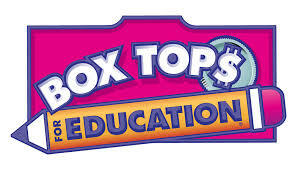 Our school earns cash - Twice each year, Box Tops will send a check to our school for each Box Tops coupon redeemed, up to $20,000 each year.